This screen will appear when VAG-COM is attempting to establish communications with a Control Module. IC= Shows the number of times the session has been initialized. If IC increases beyond 1, communications are less than 100% reliable. TE= Counts transmitter errors within individual packets. TE greater than 0 can indicate unreliable communication. RE= Counts receive errors within individual packets. RE greater than 0 can indicate unreliable communication. A rotating cursor shows that communication is active. Once the communications session has been established, all of the Control Module’s "Identification" data is presented here. VAG Number is the VW/Audi part number for this controller. Component contains more identification information about the controller and may contain a version number for the controller's internal firmware. Soft. Coding is the Software Coding that determines various options for the controller. Shop # identifies the WorkShopCode stored in the scan-tool that last Recoded this Control Module. Note: Some older Control Modules are not "codeable" and you may see a Bosch part number or other information in these fields. The Extra fields can show VIN and Immobilizer information or slave controller part numbers in some vehicles. This grouping of "Safe" functions are used to read various data from the Control Module. 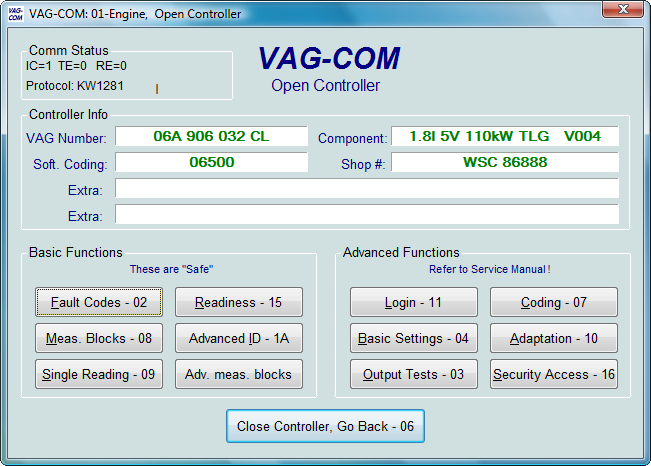 VAG-COM checks which functions are supported by each control module and enables the buttons for supported functions only. It is normal for some buttons to be grayed out on some control modules. This is an indication that the control module in question doesn't support those functions. You can click on each of the buttons in this on-line Demo for more information on the individual functions. These functions are capable of making various "programming" changes to the Control Module. You should refer to the Factory Repair Manual for your particular car (or to other documented procedures) before "playing" with these functions. It is completely possible to render your vehicle inoperable or damage components if you make changes in this section without the correct information and training. You can click on each of the buttons in this on-line Demo for more information on the individual functions. Use [Close Controller, Go Back] to properly close the communications session and return to the Select Control Module screen.